Art has apparently grossed an astonishing £200M since its debut in 1996, propelling French playwright Yasmina Reza into the premier league of international playwrights and being translated into a host of languages. There is a parallel to ‘Waiting for Godot’ (itself having been first performed in French) in that at first glance, all we see are two or three men talking and arguing and seemingly getting nowhere but as with Becket’s masterpiece, there is considerable depth to Art which leaves the audience pondering its meanings long after watching the show. This is also a play which breaks modern conventions with frequent soliloquies and occasional long speeches. The initial premise of what actually constitutes ‘Art’ is a well-worn idea, brilliantly satirised in the 1961 Tony Hancock film ‘The Rebel’ and the shop ‘Grot’ in the 70’s comedy ‘The fall and rise of Reginald Perrin’ doing a roaring trade in rubbish paintings at high prices to supposed art aficionados. With Art, the concept is taken a stage further (or perhaps lower) with just a virtual blank canvas being the object of attention (even Mark Rothko had some variation in shade and colour). There is inevitable amusement in how this is viewed but the work itself soon takes second place to the three characters’ views on art in general, which becomes the key to exploring their complex long lasting association and individual world views; Art is essentially about people. The set is superb, with towering, austere walls dwarfing the actors, seemingly suggesting their insignificance in front of such high artistic works whilst also being reminiscent of leading galleries like the Tate and the National. With this powerful backdrop and a just few items of modern, stylish furniture, there is a broad canvas in which three very different men explore their own complexities and friendship and it no surprise that Art has consistently attracted successive leading stage actors. All the outward appearances of intellect, reserve and good humour are steadily removed until the bare essence of what makes each character who and what they are comes to the fore. 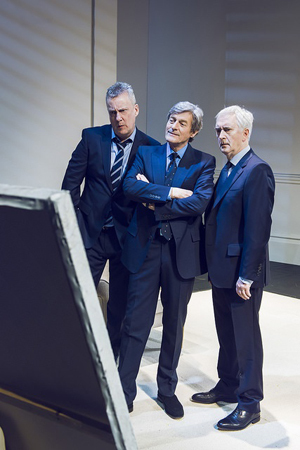 For this challenging exercise in character-delving, an impressive trio has been brought together in the form of Nigel Havers, Denis Lawson and Stephen Tompkinson. As Serge, Marc and Yvan, they create an explosively dynamic three-way face-off as egos, sensitivities and long-standing issues come to the fore. 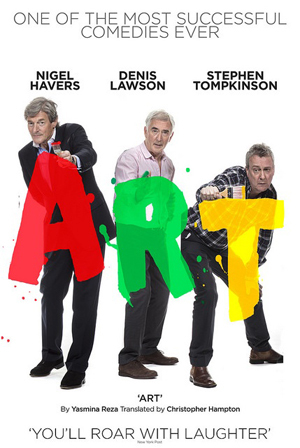 If you only know Nigel Havers from the genteel surroundings of period drama or associate Denis Lawson with polite, soft-spoken twangs from the Scottish highlands, Art gives both full-bloodied emotion with matching language to boot. Stephen Tomkinson provides the perfect counter-foil as the sensitive, intellectually-modest being who makes no pretence when it comes to truly understanding Art (or life itself for that matter). There is a superb three-way symmetry in which none of the three players is ever able to totally gain the upper hand as each go on a journey of emotional discovery. Art could easily have been a farce and at times has all the essential elements to be one, but something about the rawness of emotions seems to always keep it having one foot in reality. There is a climax involving the great work of art itself, which is both shocking and hilarious, drawing impending gasps from the audience. Also, it is hard to see how three men eating grapes in complete silence, could at the same time be so funny and yet so dramatic - and yet it is. Art is a genuinely original theatre experience, superbly acted and with an excellent set; very well worth going to see. Art is on at The Lowry until Saturday 31st March.